“Reader, if I had more space to write I would sing something at least about that sweet drink which I could have drunk forever.” This quote from Dante’s Purgatorio is the basis behind Café Dante, a new campus coffee option from the creative writing program. Café Dante, which opened last semester, is now a permanent addition to the library. It is open Mondays 3-6, Tuesdays 1-3, and Thursdays 7-9. During these hours, faculty and staff can stop by or place orders online and Café Dante will deliver anywhere on campus. 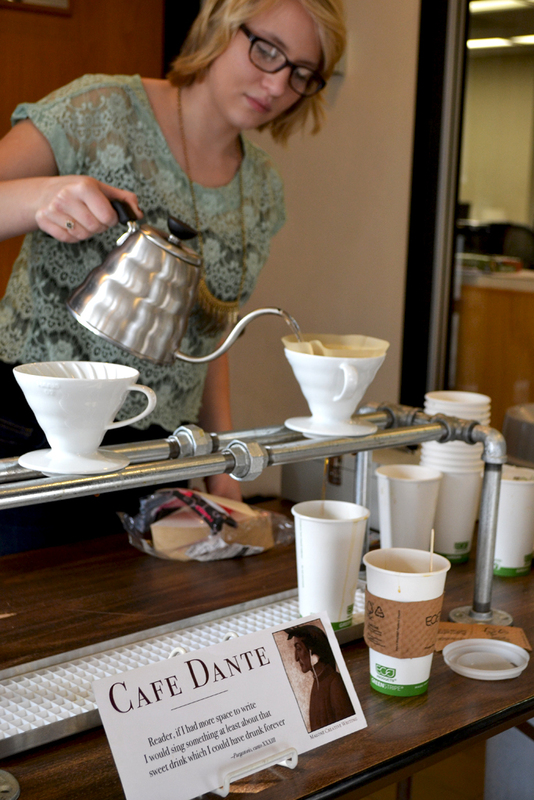 At Café Dante, you can purchase light, dark, or decaf coffee. It is brewed right in front of you so you know it’s fresh. You can also purchase pastries and gluten free snack foods. Dr. John Estes, assistant professor of English, said he plans to expand Café Dante’s offerings to include tea for those who don’t drink coffee. The proceeds go to support activities of the creative writing department. “There’s long been the desire for coffee in the library,” Estes said. It is a trend for colleges to have coffee shops in campus libraries. “We live in a café culture now,” Estes said. The coffee is purchased from Bent Tree in Kent, Ohio. The pastries they sell are from Plant Kingdom in Akron, Ohio. These pastries are organic and hemp based, according to Hope Burton, junior nursing major and creative writing minor. Burton works at Café Dante. “We want to target people on campus who prefer the more organic stuff,” Burton said. Workers are very knowledgeable about the coffee they serve. The coffee is ground and then poured while you wait. The brewing technique is a traditional Japanese method. “The method creates a very even and nearly perfect cup of coffee. It has just the right amount of extraction and time, neither too slow nor too fast,” Estes said. Estes, in conjunction with the Student Writer’s Guild, started Café Dante as a way to fund activities which the new creative writing program may like to do. It also introduces students to the creative writing program. “We want to create a friendly atmosphere in the library. It’s a little about the money but mostly it’s about building a community here with the creative writing people,” Burton said. Reference librarian/archivist, Amy Yuncker, who works upstairs in the archives most of the day, loves smelling the coffee brewing downstairs. She judges the time by when she smells the coffee when Café Dante opens. The price is just right at only $2 for a large cup. “You definitely get your coffee’s worth of it,” Yuncker said. Kaitlyn Stump is a staff writer for The Aviso AVW.